SSR LLC – VSM: A Beat and Raise Coming Up! VSM: A Beat and Raise Coming Up! VSM – A Beat and Raise Coming Up! In a significant departure from what we normally do at SSR, we are making a short-term prediction – as part of a longer-term recommendation. We expect a significant beat from VSM on Tuesday as well as positive guidance. Consensus has flat earnings versus Q1 2017 against two years of, admittedly pro-forma, data that shows sequential revenue and earnings gains. More important, is the very strong electronics data that we are seeing in the second quarter – on the manufacturers side (AMD and Samsung so far) and on the supplier side, with strong growth reported by Dow, DuPont, Praxair, Shin-Etsu and others in their electronics exposed sectors. VSM has very little history as a public company and not much sell-side analyst coverage yet, split between chemical analysts that covered Air Products and semi equipment analysts. While the company has done quite a bit of investor relations work, the demeanor is conservative. The CEO, Guillermo Novo, has worked in the past for companies that have suffered from excessive optimism and in our meetings with him we believe that he is taking a much more conservative approach in describing the opportunity set for VSM. The VSM business has very high incremental margins and we understand also has ample capacity to supply a step change in growth in the semiconductor space without the need for substantial capital investment. We would expect to see very good incremental margins on growth, whether on trend or above trend growth. The signals from the semi companies are that growth is accelerating. The stock is trading just below 18x 2018 estimates – estimates which we believe to be too low. 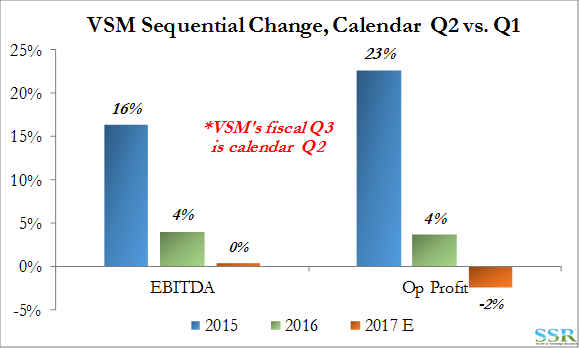 Given the growth in the space, and the leverage in incremental demand, we think that VSM can show enough earnings growth to justify a higher multiple. We would not be surprised if fiscal 2018 estimates were low by as much as 10-15% and 2H fiscal 2017 estimates low by as much as 10%. (Note: VSM has a September year-end). With a more appropriate multiple for both the sector and the growth, as much as 22x, this would generate a price target of $48 per share – 35% upside from current levels. This is likely a best case, but $42-44 per share is a good base case – 18-25%. We expect to see the company make some small bolt on acquisitions near-term, but as EBITDA, cash flows, and multiples improve it is also possible that the company could participate in some larger consolidation moves in the space within 18-24 months.